Prompted by the Hallifax and Jeffrey concert I attended earlier, I've decided to review this recording on the works of Christopher Simpson. Simpson is one of the composers that lived between the great English composers of the late Renaissance and Henry Purcell of the mid-Baroque era. As a flowering nation in the music and arts, England plundered into civil war in the mid-17th century. And while the Puritans were in power during the Commonwealth era, the majority of music activity as we know ceased to exist. Music turned underground, and was supposed only played in households. Christopher Simpson fought during the Civil War, on the royalist side, but after a crushing defeat, he fled to the house of Sir Robert Bolles in Scampton, Lincolnshire. Bolles was punished for supporting the royalists, and thus was reduced to living in his manor there. Well, Simpson lived in Bolles's household and acted as the music tutor to Robert's son and other extended family of the Bolles. It was during this time when most of his famous music was written. Simpson was a viol player, and all of his music had something to do with the viol. Today, his most important contribution is a viol method he published, called The Division Violist. Organized in three sections: (1) what the viol is and how to play it, (2) chords and counterpoint, (3) divisions on a ground bass, it is an extremely valuable resource on the performance practices of English viol music til this day. The music on this recording is titled The Monthes, referring of course to the monthes on the calendar. Each month is a fantasia, written for an ensemble of a treble viol, 2 division viols, and continuo. 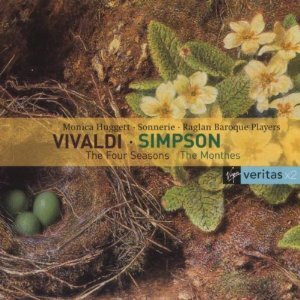 Compared to the vivid programmatic works of Vivaldi or Telemann, Simpson's pieces are less descriptive and do not portray anything specific of nature. They are said to be mood pieces, and even so, you won't find a particular one associated with each month. These fantasias are single movements but consist of multiple sections, something commonly seen in those days. That means that each fantasia will go through multiple time signatures and contrasting emotions. Given the nature of English consort music, don't expect violent swings in the music as you would with the late Baroque music. However, upon repeated closer listening, I started to notice the intricacies and the beauty within the music. It's like going from fried foods and thick sauces to a steamed dish prepared with olive oil and salt. Nothing too exciting for the taste buds, but you really get to experience the real sweet flavor of the meat. Monica Huggett leads Sonnerie in this recording, where Huggett plays on the violin instead of the treble viol. In doing so, the treble voice becomes a bit more dominating, given the features of the violin. There also seems to be a typo in the CD inserts, as Ms. Emilia Benjamin should be playing on the viola da gamba and not the violin as indicated. I doubt that the violin could cover the musical range of the division viol. Also, they specify the maker of the instrument, and Richard Meares was a well-respected English division viol maker. English consort music is not my favorite genre, and despite owning enough recordings, I've still not developed an affinity for it. That being said, I'm actually quite pleased with how Sonnerie approaches the music. Their playing is well-articulated, has a sense of direction, leans in on the dissonances, and in doing so, are lively in their own right, in contrast to some performances which play through it more plainly and let the polyphony do its own talking. 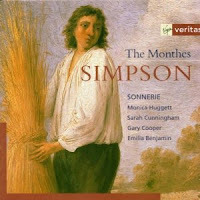 Within the framework of consort music, Sonnerie's rendition of Simpson's The Monthes is well-crafted, where I'm starting to attain some increased enjoyment and appreciation lately. For filler space, they've also included a suite and two divisions upon a ground. Still, however, I don't find the music terribly interesting in long listens. As part of a mixed grill, perhaps, it has its place. I do like August, my own birth month, starting off with a little contrapuntal fantasy, peppered with the English mannerisms. Despite the quality of the music, Ensemble Sonnerie does a good job. Yes, August grabs your attention from the start. As for the other months, it takes time to settle and ramp up. Been listening to some Thomas Tallis. Most of his sacred music for voices doesn't quite cut it for me. Of course, his 40-part Motet is always a gorgeous piece.